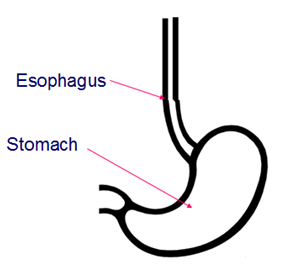 The esophagus is a tube that contains muscles in its walls, and is designed to move food (and saliva) from the mouth to the stomach. The muscles in the esophagus are designed to contract in a coordinated way, forcing food from just below the mouth, all the way into the stomach (this is why healthy people can eat a chocolate bar while upside down – you can try it, if you wish). This action is called peristalsis. There is a complex network of nerve fibers within these muscles, making sure that coordinated waves of contractions happen in the correct order, steadily squeezing whatever the esophagus contains into the stomach. At the top end of the esophagus, there is a tight band of muscles that often stays closed, to avoid having excess contents in the esophagus. It acts a bit like a trap door, opening when you need to swallow. It’s called the Upper Esophageal Sphincter. Similarly, there is another band at the bottom of the esophagus, just above the stomach. It’s called the Lower Esophageal Sphincter, and is designed to prevent stomach acid from going back up into the esophagus (and potentially, all the way up to the mouth, and then through the voice box and into the lungs. Both sphincters open at the appropriate times, when you need to swallow. When the Lower Esophageal Sphincter opens when it’s not supposed to, acid can travel into the esophagus. This is known as heartburn, and the medical name for this is Gastroesophageal Reflux. The respiratory tree starts with the mouth and nose, which conduct air to (and from) the voice box (or larynx). The larynx sits right above the trachea, which is a hollow tube that divides, at its bottom, into the main bronchi (or bronchial tubes). 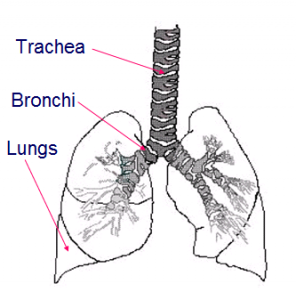 The bronchi bring air into each lung. Each main bronchus divides into tinier and tinier bronchi, finally ending in the air sacs or alveoli, where oxygen is transferred into the bloodstream, and a waste gas produced by the body, carbon dioxide, is transferred from the blood into the alveoli, so it can be exhaled. The trachea is made of rings made of cartilage, separated by tough, fibrous tissue (you can feel some of the cartilage rings just below your Adam’s apple). The trachea’s rings, viewed from above, are actually C-shaped, and the back of each ring is made of more tough, fibrous tissue, rather than cartilage. The walls of the trachea and bronchi also contain some muscle, which can contract to narrow the windpipes, to prevent irritating gases (like smoke) from entering the lungs. This happens abnormally readily in people with asthma.